I am a lot of things. Some of those things are great, some of them are probably pretty annoying. One of the annoying ones is that I am the world's most indecisive decorator. EVER. I have framed photos stacked up in the bedroom because I can't figure out exactly how I should hang them. I have big empty spaces on the walls because I can't find the perfect thing to go there. When Adam and I agreed to replace our bedding, I agonized for weeks over picking the right set. For a while, this wasn't a huge deal. The kitchen and main living area were decorated (enough) and I could use the "yeah, we just moved in not too long ago and we're trying to make sure we really love what we do" excuse for all the other rooms. But we've been in the house almost ten years now, and the rooms that look the best are the girls' bedrooms. I really want to make the house look great, but I'm just so horribly paralyzed when it comes time to actually spend the money to make it happen. But I'm crazy jealous, because now I have friends who are beginning to have gorgeous homes, despite also having small children, and I feel like it's time to step it up. A few weeks ago, Wayfair (which, I found out, is one of Adam's favorite sites...who knew?) invited me to be part of their homemaker program. I was skeptical, since, although technically I am a homemaker, I don't know many people who are interested in emulating me. However, they assured me they were looking for "real" people, and I was real enough! One of the first assignments I had was to chose a spot in my home that needed a "pop" of color. Initially I was plunged into indecision again - so many areas to choose from! - but I finally settled on our master bathroom. When we were young, and stupid, and engaged, I made the mistake of choosing a particular Nautica set for our registry. The pictures were so pretty! So clean! So elegant! So white! So I chose an all white shower curtain. With white accessories. Our towels were navy, and when I looked at them, all clean in their packaging, I congratulated myself on going with such a simple, classic, beautiful look. Six months later we bought this house and finally pulled all those registry purchases out of the packaging and I realized that white tub + white walls + white tile + white accessories equals a very white space. The navy towels did very little add color. But that was ok, right? Clean. Classic. Or not so much. Because naturally, the whites don't really match and it just looks...blah. 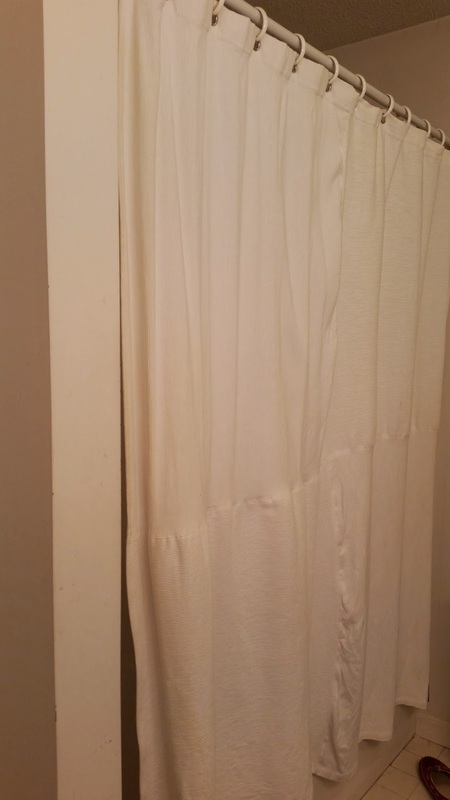 The shower curtain quickly became water marked, and dingy. So I checked the washing instructions. Do not hand wash. Do not machine wash. Do not dry clean. Spot clean only. Who the hell buys a shower curtain that CAN'T BE CLEANED??? I was giddy with the thought of getting to get all the white out and get some color into this room! First, the shower curtain had to go. I considered several options. One of the things I love about Wayfair is that you can put all sorts of criteria in when you search. MACHINE WASHABLE. Done. I had so many to choose from. Finally, I went with this one. I know, I know. Not super colorful. But wait for it. The navy valence and towels weren't going to work with the browns in the curtain. 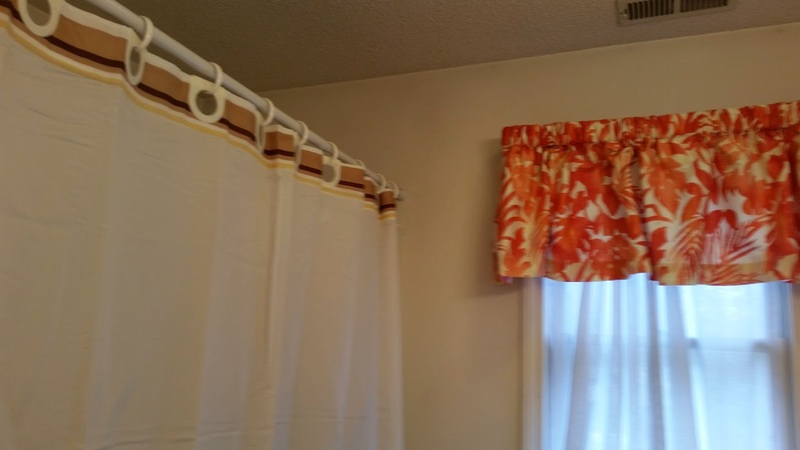 I love this valance. The coral color makes the room seem lighter, the white of the walls and shower seem cleaner, and gives the room this incredible freshness that I was missing. All that we needed was some coordinating towels. I know, it's a bathroom, it's my bathroom, so it's not the most visible room to guests and not many people will get to enjoy this pop of color. But every time I shower, take my bath, or put up my hair, I smile now, because it feels so fresh. Turns out that Wayfair really knew what they were doing, inviting a total decorating mess into their homemaker program. Because if I can do it, anyone can. I'm inspired to give the rest of the house a facelift and share the progress. But YOU, my readers, probably make out the best from my new gig. Because Wayfair is giving away a $100 gift card to one of MY readers. Not one of those giveaways where your entry gets lumped into a giveaway from 900 other bloggers. One of YOU will soon have $100 to spend on anything you want at Wayfair! I can't wait to see who gets to treat themselves - and their home - to a spring freshening from Wayfair! So tell me, readers, what would YOU choose? * All rules defined by Wayfair.com: No purchase necessary. By leaving a comment you agree to the rules of this sweepstakes. Each comment to this post equals one entry and must include a name and valid email address to be eligible. A comment must link to a product from Wayfair.com to be considered for this sweepstakes. One entry per household. Limited to entrants over 18 in the US and Canada, residents of Florida, New York, and Rhode Island are ineligible to enter. Contest begins as of the time of this post and ends on 5/4/14 at 12am. The winner will receive a Wayfair gift card/promo code, a retail value of $100 US. The number of eligible entries received will determine the odds of winning. All comments will be numbered in the order they are received and the winner will be chosen randomly by From Meredith to Mommy using the Random Number Generator at random.org. Winner will be notified by email at the address given in their entry and must respond within 72 hours to receive their prize. If the winner does not respond within that time, a new winner will be chosen. The prize will be provided by Wayfair.com. From Meredith to Mommy is not responsible for any problems with receipt of the prize. This contest is governed by the rules of Massachusetts, void where prohibited. This sweepstakes is sponsored by Wayfair LLC, 177 Huntington Ave., Boston, MA, 02115.